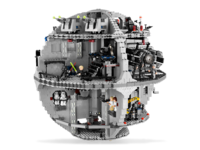 10188 Death Star is a Star Wars set based on both the Death Star and the Death Star II from the Star Wars Original Trilogy. 41 cm high and 42 cm wide. This product is 41 cm high and 42 cm wide. The set is built around a circular base made up of a triple layer of angular plates, and the lowest level is directly on top of this. One feature of this level include some barrels, many smaller cans, and a pipe. There are two wall pieces with a special sticker on top of which, on another set, shares the same piece. This area spans two levels. The walls around the centre each have a pair of lights and buttons on each side. The second bag is opened on the second level, after the floor for it has been built. There is an elevator area with red lights, a rack of laser guns, and a shaft. In the landing area there is a pair of grey and blue barrels, most likely containing fuel. The exit to this area has a yellow and black "caution symbol" part. On the wall which separates the elevator section from the rest of the floor is a pulley. A piece of string is connected to it, and makes it possible to pull the pair of elevators so that when one goes up the other goes down. This section has walls between rooms, unlike the section below it. Again, the shaft has buttons and lights adjacent to it. Instead of the floor spanning the entire circle, it only spans three-fourths, with one fourth being simply a lon, angled connection, making the room taller. It has multiple entrance and exit spots, each with lights on either side. On one of them is a large cone with transparent green parts at the top which prevents the door of the trash compactor from sliding out of the set. There are many handle "grip" parts but only one ladder. The entrance and exit to the trash compactor is the shaft. The sides can both open and close. This room spans one-sixth of the circular area. The other side of the elevator is round. On the top of the shaft on that level is a set of red lights. The wall cutting the trash compactor from the shaft is placed on a flat surface so that it can slide out. To open or close the doors of this area, there is a TECHNIC axle which can make these functions possible. There are pieces of trash that are placed in this section as well. A large laser can be found next to the trash compactor, and is composed of two lasers, and a TECHNIC cannon. This part can rotate and angle up and down. The laser is piloted by one minifigure, but has another seat. There is also yellow claw which is also piloted by one minifigure. The next floor has a black area over the elevator area, and serves as the landing pad for the smaller TIE Fighter. There are three boxes and some arrows pointing towards another room, as well as the hole for the elevator. The doorway to the room has an access panel similar to the one from the Star Wars video games. This doorway contains a door that slides out. The area right next to it has a set of barrels and a tube. There is also a ladder leading up to a control area with some computer screens, and a gear which turns a device. Also occupying this area is a window to view the room. This room also contains the hyper-laser with the control panel array, which can rotate and angle. The room is connected to the next room by a doorway with lights on either side. There is also a hole which drops to the trash compactor and some small steps. A control panel operates a device here. The last fourth of this level has a part which stops minifigures from falling over the edge of the area. A set of openings into the tall room are covered by some "robot arm" parts. The room has a stairway leading up to a viewing area. This place has a chair which can rotate, and a pair of transparent blue lights. The room's only doorway is covered by a large panel with a sticker which represents a long hallway. That doorway in turn is in its own small section. Seen at the end of the tunnel is the "hallway piece." Leading to the "hallway piece" is a angled part representing the hallway as well. The area has a gear which turns to open the a hole to the trash compactor room covered by a vent. There are two control panels in the area controlling this and the gateway. There is a wall on the other side which can be raised by the turn of another gear. A control panel is right next to this piece. The area is a jail, with lattice. A laser and camera guards this area. On the top floor are sleeping quarters for Imperial Stormtroopers. It contains a bed, a chair, a table, and a rack of equipment. Next to it is a room with two sets of chairs. One of them rotates the super-laser when turned. On its other side is a pair of large double-lasers. 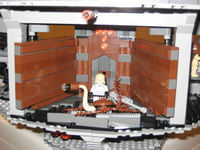 It connects to the sleep room with a small doorway too small for a minifigure. There is also a conference room on this floor, with seven rotating chairs and a large table. The central shaft contains an elevator which connects the conference room and the sleeping quarters to the bottom floor. The Death Star was a large space station with the power to destroy entire planets. The first Death Star was ordered by the Separatists to be built by the Geonosians then construction was later taken over by the newly formed Galactic Empire. After its destruction by the Rebel Alliance, the Empire built another. The purpose of such construction was to instil fear throughout the galaxy. After the completion of the first Death Star, Darth Vader captured Princess Leia and questioned her regarding the secret Death Star plans he believed she had in her possession. This led to Grand Moff Tarkin executing the command to destroy the planet of Alderaan, using the superlaser. Just prior to her capture, Leia secretly had sent her two droids, C-3PO and R2-D2, in an escape pod to later bring Luke Skywalker, Han Solo, Chewbacca, and Ben Kenobi to rescue her. After escaping, Luke Skywalker and other Rebels attacked in X-Wings and Y-Wings, and destroyed the first Death Star. The Empire later created another Death Star, titled the Death Star II, which was much larger than the first. When Rebel forces launched an assault on this Death Star, it was still incomplete; however, its superlaser was operational, and destroyed several Mon Calamari Cruisers. 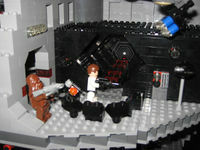 The Second Death Star was finally destroyed by Wedge Antilles, who was piloting an X-Wing, and Lando Calrissian, who was piloting the Millennium Falcon, by flying into the space station and firing concussion missiles and proton torpedoes at the main reactor, which in turn led to its destruction. 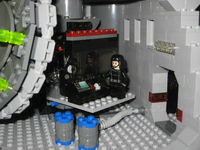 Almost every scene that took place in the Death Star in A New Hope and Return of the Jedi can be reenacted in this playset. Part:10188stk01 is unique to this set. This is one of three sets in which Part:59349 is Black. This is one of two sets in which Part:x64 is Black. This is one of three sets in which Part:30562 is Medium Stone. This is one of two sets in which Part:30361c is Dark Green. Part:2454pb25 is unique to this set. Part:59349pb04 is unique to this set. Part:3040pb11 is unique to this set. Part:3039pb46 is unique to this set. Part:2454pb24 is unique to this set. Part:2362pb18 is unique to this set. This set has the most minifigures released in one non-minifigure generic set ever with a total of 24. Newer versions of the set had newer head printings (with pupils and redesigns) for Obi-Wan and Han, but now contain newer head printing for all the characters. The newer versions also include Leia's and Luke's new hairpieces. This is a description taken from LEGO.com. Please do not modify it. 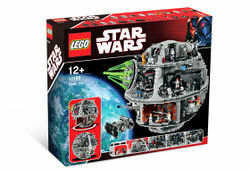 (visit this item's product page) Battle inside the Death Star™! 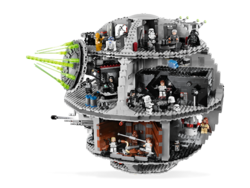 Includes 24 minifigures and droids, plus all-new Dianoga™ trash compactor monster! 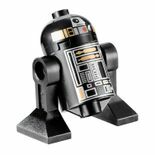 Includes 6 new and exclusive minifigures and droids only found in this set: Luke Skywalker™ (Stormtrooper™ outfit), Han Solo™ (Stormtrooper outfit), Assassin Droid™, Interrogation Droid, Death Star Droid and 2 Death Star Troopers™! 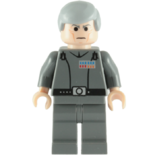 Also includes Luke Skywalker, Han Solo, Obi-Wan Kenobi™, C-3PO™, R2-D2™, Princess Leia™, Chewbacca™, Luke Skywalker (Jedi Knight), Darth Vader™, Grand Moff Tarkin™, Emperor Palpatine™, 2 Stormtroopers, 2 Emperor's Royal Guards™, R2-Q5™, and mouse droid!. Death Star measures 16” (41cm) tall and 16½” (42cm) wide! TIE Advanced measures 3½" (9cm) wide! Facts about "10188 Death Star"
Battle inside the Death Star™! This page was last edited on 17 August 2017, at 23:48.